Detaining American citizens to hand them over months or even years later turning offenses into favors is becoming a tradition in dictatorial countries like North Korea. Last year – strangely or not – Belarus has followed the suit by detaining an American lawyer. Pardoning the ailing prisoner after the meeting with seven representatives of the US Congress who visited Minsk on Tuesday, June 30, Belarusian President Alyaksandr Lukashenka undoubtedly scored points with the United States. Emanuel Zeltser has been in a Belarusian prison since last March after being convicted for industrial espionage in a closed trial. The commission asked for Mr. Zeltser’s release on humanitarian grounds as continued incarceration would endanger his life. Of course, Zeltser is not the only ‘guest’ treated to a Belarusian prison on political grounds. Three more have being held in custody since February. Unfortunately, Belarusian entrepreneurs Mikalai Aytuhovich, Yuri Liavonay, and Uladzimir Asipenka will hardly succeed in bringing a foreign delegation to their rescue. It will take more effort on Lukashenka’s behalf to have the three-year-old economic sanctions against Belarus lifted, however. After securing the release of his countryman, the head of the delegation Senator Benjamin L. Cardin (D-MD) reminded the Belarusian leader that removing the blemishes from his human rights record is crucial to reestablishing the country’s discourse with the West. Reforming electoral legislation and granting freedom of speech, freedom of assembly, and freedom of association to Belarusian citizens were also discussed. The delegation also met with opposition activists– several of whom once suffered the fate akin to Mr. Zeltser’s. Congressman Christopher Smith, one of the authors of the Belarus Democracy Act, stressed the need for a sincere and open dialogue with the opposition. “You have a road map. Everything is written down in the Belarus Democracy Act. It mentions the rights that must be observed,” said Smith, expressing hopes the economic crisis will make Lukashenka think. Adopted by U.S. Congress in 2004 and extended by President Barack Obama, the Belarus Democracy Act allocates U.S. funds to Belarusian opposition parties, NGOs and independent media and makes humanitarian donations to the Belarusian government contingent on liberal reforms. The U.S. delegation also included Senator Durbin, Commissioner Senator Roger Wicker (R-MS), Commissioner Congressman Mike McIntyre (D-NC), Commissioner Congressman Robert Aderholt (R-AL), and Congressman Lloyd Doggett (D-TX). This is the first visit of a delegation of such level to Belarus for last ten years. A week earlier, Commissioner for External Relations and European Neighborhood Policy Benita Ferrero-Waldner also paid a visit to Minsk announcing the allocation of an assistance package for the improvement of food safety in Belarus. Western visits increased after Lukashenka had adopted some limited liberal reforms and granted amnesty to a series of political prisoners. His nominal bow to the West resulted in lifting of the EU travel ban for Belarusian officials and an invitation to join the Eastern Partnership. This spring Belarus received an International Monetary Fund loan of $1 billion, raising its total pledge to $3.4 billion. Of course, you can’t eat your cake and have it, too. Lukashenka’s courting the West resulted in Russian criticism of his economic policies and a ban on Belarusian dairy imports. A release of one troubled American will hardly open a new page in Belarusian relationship with the West. A good start could be made by apologizing to 30 US diplomats expelled last year after the expansion of US sanctions. The surest way to find a common language with the USA and the EU, however, lies in improving Belarus’ human rights record. The West has a lot more to offer to Belarus than Belarus to the West. There is no time for bargaining or testing the limits of the Western goodwill, especially because the freedoms time and again asked from Belarus are what every developed country is proud to offer to its citizens. 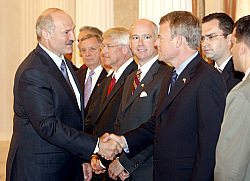 Read more about Zeltser’s misfortune: “US lawyer imprisoned in Belarus freed after pardon,” The Washington Post, June 30, 2009. On June 16, 2006, by Executive Order 13405, the President declared a national emergency and ordered related measures blocking the property of certain persons undermining democratic processes or institutions in Belarus, pursuant to the International Emergency Economic Powers Act (50 U.S.C. 1701-1706). The President took this action to deal with the unusual and extraordinary threat to the national security and foreign policy of the United States constituted by the actions and policies of certain members of the Government of Belarus and other persons that have undermined democratic processes or institutions; committed human rights abuses related to political repression, including detentions and disappearances; and engaged in public corruption, including by diverting or misusing Belarusian public assets or by misusing public authority. Despite some positive developments in the past year, including the release of internationally recognized political prisoners, the actions and policies of certain members of the Government of Belarus and other persons continue to pose an unusual and extraordinary threat to the national security and foreign policy of the United States. Accordingly, the national emergency declared on June 16, 2006, and the measures adopted on that date to deal with that emergency, must continue in effect beyond June 16, 2009. Therefore, in accordance with section 202(d) of the National Emergencies Act (50 U.S.C. 1622(d)), I am continuing for 1 year the national emergency declared in Executive Order 13405.